I'm a Yankee fan ! New York Yankee fans are some of the most rabid sports fans in the world. This song entitled I'm a Yankee fan is the anthem to the fans of one of the world's greatest sports teams. It's New York brassy, bold, and boisterous!! 1. I'm a Yankee fan ! The song: I'm a Yankee Fan was written as a tribute to Yankee Fans! 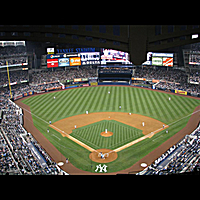 The New York Yankees are among the greatest sports teams in the world with by far the most championships in any sports. Yankee fans are among the most zealous fans in any sport anywhere. Harry King who was the producer, arranger and singer in this song hails from Texas and Maine, Harry has three platinum albums and two gold singles for recent projects he played keyboards on. The platinum albums are:The Carter Volume 2 and The Evolution of Robin Thicke. Also Harry has two gold singles for older records and has been a journeyman throughout the years in music producing Engelbert Humperdinck, Joe Perry of Aerosmith, Freddy Cannon and the Afternoon Delights and playing keys on Robin Thicke's first two albums and Lil' Wayne's "The Carter Volume 2." His recent You Tube video makes a plea to Americans to help our POW/MIAs from Texas in "Bring Me Home." DRUM ROLL! TRUMPETS! STRIKE UP THE BAND! WHO'S THE GREATEST YANKEE FAN IN THE LAND? WHO CHEER AND SHOUT I'M A YANKEE FAN! OH OUR YANKEES ARE THE YANKEES AFTER ALL!! ALL YANKEE FANS BELONG IN BASEBALL'S HALL!